Funky Frum is a Los Angeles-based business with an online store that sells modest dresses, skirts, and various other cover-ups. The company seeks to provide clothing that is modest, and "...sophisticated, feminine and truly stylish." The skirt collection is especially impressive. You'll find pleated skirts, wrap skirts, tiered skirts, a variety of jean skirts, and various colors of pencil skirts. Most of the skirts that we saw in the online gallery are designed to fit below the knee. Several of the skirts were priced in the $30. range. The dress section of the website had fewer options at the time of our visit, but there were some interesting jumpers, some sale items and a tri-colored maxi dress. The "Tops" section also displayed some neat items, including a velvet hoodie and a double-stitched hoodie. 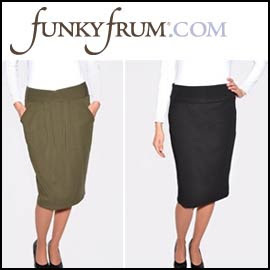 The Funky Frum website is worth your time if you are looking to update your wardrobe with some conservative and stylish articles of clothing.